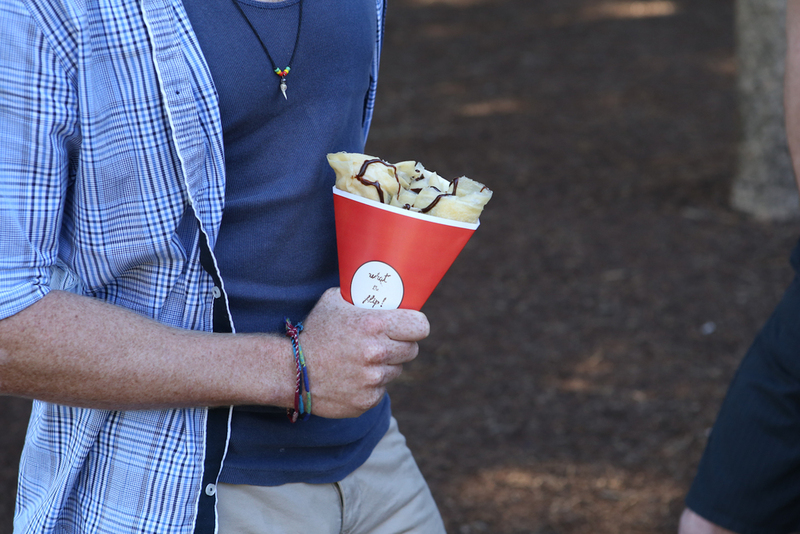 the best flippin' crepes on wheels! What the Flip! is bringing the good stuff to you. What the Flip! is rolling in the best flippin' crepes you have ever had! We park up anywhere, any time, so keep your ears and eyes open for locations! Here at WTF! we pump our food full of fun. We start with the fundamentals of crepeology to guarantee something that you crave; then we offer some extras so you can cre-ape your own crepes! And then comes our special recipes providing some unique creations to quench your culinary curiosity. No matter which you choose, you will not be disappointed! Our operating hours vary depending on what is on. Scroll down to see where we will be! Our crepe selection constantly changes with wonderful creations. Here are some of our favorites so far! You can mix and match any of the add on's. Fresh strawberries, blueberries, swirled with raspberry coulis, topped with roasted almonds and fresh whipped cream. Light, crispy crepe filled with oozing fench caramel, chocolate bits and roasted almonds for some added cruch and topped with fresh whipped cream. No more to say. Our twist on an old favourite. Fresh banana and blueberries, paired with nutella and roasted peanuts. Topped with fresh whipped cream. Chocolate pearls, chocolate bits, fresh raspberries and roasted peanuts. A lot more decadent than it should be! For all you cheese lovers out there, this one is for you! Prosciutto, salami, parmesan, mozzerella, cheddar, brie, mixed lettuce salad, and home made raspberry vinegar dressing. Chorizo, leg ham, crispy bacon, braised tomatoes, chedder and mixed lettuce salad wrapped in a delicious savoury crepe. Sauteed mushrooms with thyme and garlic, cheddar cheese, and mixed lettuce salad. Perfect for all you vegetarian lovers! Grilled chicken topped with teriyaki sauce, spinach, mayo and cheddar cheese. If you like a little spice, try this one out! Fresh warm crepe filled with chorizo, fiery jalapenos, capsicum, braised tomatoes, chedder and mixed lettuce salad. We accept bookings year round up to 6 months in advance. If you want to have us at your next event, get in touch. We are always keen for a party! See below for upcoming locations! Or Get in touch!